‘ACA’ Commercial and Industrial Activated Carbon Filters – Granular Activated Carbon (GAC) is designed for the reduction of tastes, odors, and dissolved organic material from municipal and industrial water supplies. The most common application is the removal of free chlorine from water supplies as pre-treatment to other water treatment systems such as reverse osmosis. Inlet water to activated carbon systems should be relatively free of turbidity and iron for optimal performance. Numerous types of activated carbon are available for specialty applications.. In addition to service flow, the selection of a filter system must take into account the available backwash flow rate. This is the most important function in the proper operation of a filter. Periodically, the accumulated impurities (iron, sediment, etc.) must be removed (backwashed) from the filter. Backwash flow rates are always much higher than service flow rates and therefore limit the size of filter that can be installed. As a general rule in sizing filters, select the largest filter that can be backwashed with the flow rate available at the point of filter installation, then note the service flow rate for the filter selected. 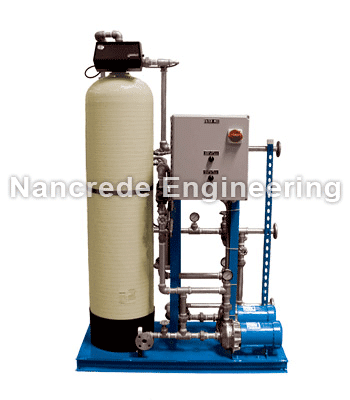 If it is not adequate for the flow to be treated, a twin or triple filter installed in parallel is required. A parallel installation will increase the service flow while permitting each filter to be backwashed separately with the existing water supply. Contact us right now at info@nancrede.com or +1 888 56-WATER (569-2837) to buy or learn more about industrial water filters, or for rapid response service in Indiana, the Midwest and throughout the U.S. for your industrial water systems. Our experienced engineers are ready to help.